This American horror film has more fun playing with racial tensions than with scaring us to death, which for some will be a bit of a letdown. The problem with ‘Get Out’ is that it is perhaps a touch too in love with its big idea: that for a young African American man, meeting your white girlfriend’s parents might be hazardous to your health. (Even if they do say that they ‘would have voted for Obama a third time’). Serious young photographer Chris (British actor Daniel Kaluuya), clearly adores Rose (Allison Williams, Marnie from ‘Girls’). Still, their trip out of the city to her family’s secluded mansion in the suburbs fills him with dread. That deer they crash into on the drive up doesn’t help Chris’s fraying nerves – and the way the animal stares him down during its last gasps feels like a warning. 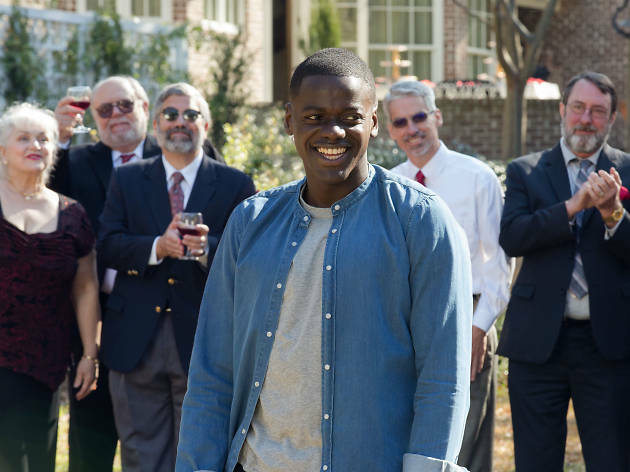 ‘Get Out’ is sharp and cutting during its build-up. Rose’s parents (Catherine Keener and Bradley Whitford) are awkwardly ingratiating, making a comic meal out of white liberal privilege (‘Hug me, my man!’ Rose’s neurosurgeon dad exclaims meeting Chris). Meanwhile, the family’s black servants disquietingly look on like wide-eyed zombies. The writer-director of ‘Get Out’ is Jordan Peele, one half of the defunct Comedy Central show ‘Key & Peele’. While you can’t help but cheer his debut film’s ambitions, the discipline he found in skit-writing is lost here. Many of the brightest moments in ‘Key & Peele’ were miniature nightmares in themselves – like their classic sketch ‘Continental Breakfast’, a ‘Shining’ parody. ‘Get Out’, on the other hand, reveals its dirty little secret a bit too broadly. Still, Peel deserves another shot to get it perfect. Original film; a bit Stepford wives and very much worth watching the original ending to the film afterwards. I am glad that they went with the ending that they did; the other ending, well I didn't think it gave you the closure that you needed. Some interesting ideas well paced and creatively delivered. This is a very unusual horror film with a lot of twists and full of tension. Not for the lighthearted as it does contain a large amount of blood. I enjoyed watching this film as the story is very different to other horrors. One of a kind, I recommend for a good scare/thrill. This is an intriguing movie about a black guy who goes to meet his white girlfriend's parents full of apprehension. Right from the start it is full of tension and suspense. There are a few twists and turns along the way, and part of the fun is trying to work out what the final twist will be. Honestly, I found the ending a little predictable when it came to it, but overall a solid movie. Definitely worth a watch. There was a hell of a lot of hype about this movie and although I enjoyed it, I felt underwhelmed just because of the hype really. When a black boyfriend has a chip on his shoulder about the parents of the girlfriend he's about to meet at a weekend away not liking him, at first we think it's all in his head. Of course when he gets there, things aren't quite what they seem and we're taken down not one, but two rabbit holes of despair with frightening consequences. There's some jump scares, some spine tingling moments and also some comedy thanks to the protagonist's best mate whom he calls to see if he's imagining things. Is he? Or are things as bad as they seem? Watch to find out but don't believe the hype. I went along out of curiousity - I am not usually a horror-film fan, but this looked like it might be something slightly different. Unfortunately, I ended up feeling that the film was too long, which is never a good sign. A bizarre plot didn't really hold up over an hour - it felt like a strangely extended Black Mirror episode (perhaps this feeling was influenced by the protagonist - who was a star in the series), which didn't really work. Black Mirror's power lies in making you consider something afresh, or by pushing you into an alternate reality and immersing you for a powerful hour, Get Out on the other hand felt like it was trying to build upto something for a long time, which then fizzled out like a disappointing firework. The finale was neither as grand, nor as scary as it ought to have been, even for a horror-film novice! This is a gutsy film. The story is solid and our protagonist is our perfect front man for this darkly comic horror tale. For me,I am a big horror fan,so I found echoes of 1989's 'Society' ,Stepford Wives, The Faculty to name but a few. The similarities or influences of horror flicks past,only give it that classic feel and,I think,makes it sit on that shelf alongside its predecessors.That being said,it was all the better for it,this isn't just a horror flick,this is a film with something to say about modern society and the undercurrent of racism. Not only that but a mild history lesson of how slavery was potentially justified and how it was viewed at the time. Also it's British and a darn good film! One to see,this is a mark of the age we are living in,whilst giving us to jumps and giggles too. Certainly a brilliant, blackly funny, satirical horror film, tackling the hidden underbelly of liberal racism in America. Not a five-star review simply because towards the end, I felt the plot lost its way somewhat and became a bit ridiculous! But, all in all, this film is definitely worth a watch and will make you think about the current state of race relations in America, while still being very entertaining. A gripping, funny and thought-provoking black comedy - it's a must-see in my opinion! You'll jump, but it's not scary and by no means a "horror". I didn't read any of the reviews as I like to watch a film with fresh eyes then read the reviews. I actually enjoyed this film. I'd called it a black comedy rather than horror. I was kept surprised throughout the whole film with the odd shock moment ( cue loud music and something makes you jump) and had absolutely no clue to the end until it happened. Normally I've worked out what's what half way through a movie. So if you like to be kept guessing then this is for you. Unexpectedly good film. Sceptical as not really a fan of thriller movies - but the subtle humour and jumpy horror moments made for an interesting film, which kept you intrigued! I love Get Out as an example of a little appreciated film genre: the dark comedy. While there are laugh out loud moments from a comic relief best friend - it's the irony, subtly and pronounced, that really made me giggle. It's a movie you just have to go with - let it take you where it wants to and it somehow all makes sense at the end - in a very strange twist. Its not the standard horror movie but there are some good scares but it's the building of the tension is what is done well. I loved watching this movie in the cinema because the loud audience, the laughs the "don't go down there!" Just added to the comedy. I personally have liked to sum this movie up "is it scary cos its funny or is funny cos its scary??" When a film is as hyped as much as this it's hard for it to deliver but I enjoyed this film. This isn't a horror by any stretch of the imagination, Logan is more gory than this. This is a good psychological thriller with comic relief provided by the mouthy best friend of our hero. This is a good film with a very interesting subtext and if it gives more people an awareness of casual every day racism that most people don't even notice unless it directly affects them then that's an added bonus. Wow .... I dont know where to start! I didn't know where this was going but I knew I was willing and ready for the journey. Boi is this one messed up movie!! Even days after watching it I'm still kind of messed up over it. It starts off as a psychological thriller but then just turns into a mad wild situation! The ending made it all better that's what I'll say .. But even now I have the chills just thinking about it!!! 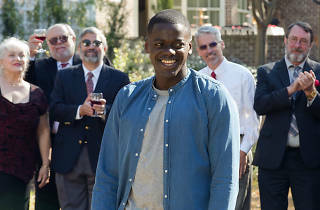 Get Out is definitely more of a jumpy thriller than a horror which, for me, was a good thing. It's a great story, very well executed - the acting, the music, the subtle humour - it all worked together perfectly. It had plenty of 'don't do it!' moments, as does any good thriller, and had my stress levels at *extremely high* consistently from start to finish. A must watch! Get out has a good number of "jump back in your seat" moments which is always a good thing in a horror movie. It also has humour, both laugh out loud bits, and some sly, embarrassing observational jokes. These carry you along nicely to the next scary part. I really liked Jordan Peele's manner of dealing with incidental, institutional racism in this film. It is there throughout the movie, and it isn't ignored, but it is supposedly not the main storyline. The main story is a brainwashing, Stepford, comedy/horror thing. Jordan Peele shows great promise as a debut director in his light touch with an awkward subject. The ending is interesting too, just as I was expecting the more usual darker turn, the twist arrived, and this ending suited the movie. I enjoyed this film. I had never been to the cinema to see a movie where the audience have clapped their hands both during and after the movie (credits). The missus was entertained and she's usually hard to please. Great film. I'm not sure whether I would call this a horror film, more a psychological thriller. The acting was very good, and you were on the edge of your seat, wondering what would happen next. I found the film enjoyable, well made, well acted, smart & sharp. Like Paul M I was also reminded of "the "Stepford Wives", with a little nod to "Rosemarys Baby". It's slickly done - but ultimately this felt like a 10-minute sketch from a comedy show expanded into 1 hour and 40 minutes of a movie. The underlying joke - and rather confused satire - is fun but as a cinematic experience it all felt a bit slight. White girls who see this at the cinema with their black boyfriend will feel very uncomfortable. On DVD doubtless set to become a cult classic and I do think it will probably work better on the small screen. White Anglo Saxon Protestants - be afraid, be very afraid! It's a suspenseful, clever and well-made film, but possibly a victim of its overhyped status. It's not as revelatory as the opinions coming from the US would have suggested. This film is excellent in its sharp satire of white liberal racism, ingeniously using a 'Stepford Wives' format - it makes a good homage to those sorts of 70s socially engaged films. I don't buy the TO line that it wore its message too much on its sleeve, it was very sharp and enjoyable, so full marks from me and the packed house I saw it with! Although jumpy in places, I couldn't help but think this movie was a bit naff. I love thrillers/horror films but think it felt amateurish. That said, I did like the storyline and it was suitably gruesome. This loose remake of the Sidney Potier classic "guess whose coming to dinner" with a horror twist is a well crafted thriller from the word go. The suspense kicks in within the first fifteen minutes when certain strange behaviour of the girlfriend's parents hired help is noticed. I'm not keen to give away any spoilers and the well written fresh plot will keep you guessing till the end bits and leaves you with the chilling realisation that such disturbing incidents could be a possibility in today's world. For those who like their thrillers definitely go see this.